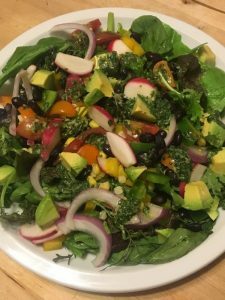 Southwest Salad | Ridge's Stitches | Health Coach. Yoga. Clothing. A southwest salad may mean Fritos and tons of meat to you but this one is packed with as much crunch, flavor and ingredients that are really good for you. I whipped this up at my Summer Self Care and Salads workshop and it was a hit. This was probably my favorite of the three we showcased. These will be posted soon. You could top the salad off with micro greens if you wanted. Micro greens are 4-40x more nutritious than the full grown plant. I try to vary it up with different colored vegetables like yellow peppers instead of red or green. It adds beauty to the salad and you truly get to taste the rainbow. Try this salad with the cilantro lime vinaigrette. It’s unbelievable and pretty simple to make! Chop all the veggies and cook the black beans if you get them dried. Toss everything in a bowl and mix with cilantro, lime vinaigrette.